HOT Products Engineering specializes in system based products for pre-heating racing engines. Check out the Recently Listed Engine Heaters. 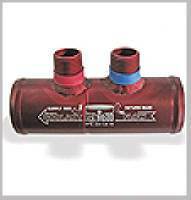 Hot Products Engineering Integrated Cooling System Check Valve - 1-3/4"
Pit Stop USA is The Online Motorsports Superstore! We feature HOT Products Engineering Hot Head Competition Engine Pre-heaters. HOT Products Engineering manufactures many innovative performance products for all forms of motor sports. HOT Products Engineering specializes in system based products for pre-heating Stock car, Sprint Car, Midget, Mini-Sprint and Kart engines. HOT Products Engineering offers several Hot Head engine pre-heater models, ranging from 750 watt units for single cylinder applications to powerful 4000 watt systems for large cubic inch V8 applications. Model 2020 is a 4000 watt system featuring dual 2000 watt heating modes that work to quickly pre-heat a racing engine. Once heated and raced, the system can be operated in a maintenance mode to keep the engine at its optimal temperature while not placing added demand on the teamas generator. This pre-heating system will work on any water cooled 8 cylinder automotive based engine. Model 1515 is a 220 volt single phase or dual 110 volt power input. This 3000 watt system features dual 1500 watt heating modes that work to quickly pre-heat a racing engine. This pre-heating system will work on any water cooled 4cylinder automotive based engine. Model MC-1500 is a 110 volt systems features single heating mode with cooling function. Like its little brother the Model SC-750, this unique system also provides effective pre-heating as well, the unit can be used to cool a previously raced engine, reducing damaging latent heat build-up and providing quick access to the engine after racing. The 1500 watt pre-heating system will work on any water cooled multi cylinder engines. Applications include; Mini-sprints and road racing motorcycles. Model SC-750 is a 110 volt system features single heating mode with cooling function. The 750 watt pre-heating system will work on any water cooled single cylinder engines. We feature Hot Head Competition Engine Heaters at low everyday prices!